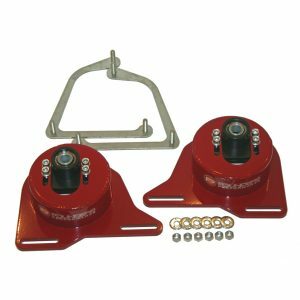 Founders Performance relocation brackets will reposition your instant center by changing your control arm angle. Lowering the axle side rear control arm will increase traction, reduce wheel hop, and give you better anti-squat. 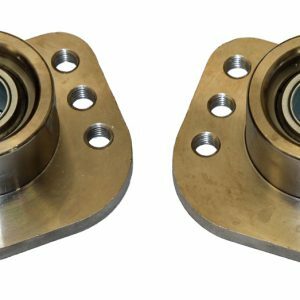 These high strength brackets are made using 3/16″ cnc laser cut and cnc formed cold rolled steel. 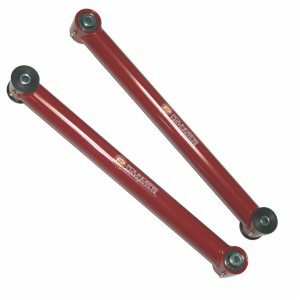 Founders Performance LCA brackets will lower the rear of the control arm up to 3″ and work with all control arms. 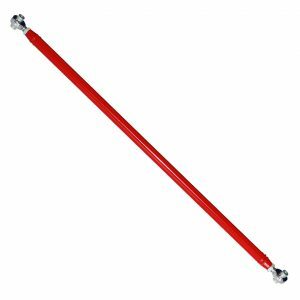 These are a must for lowered vehicles to recover lost control arm angles. 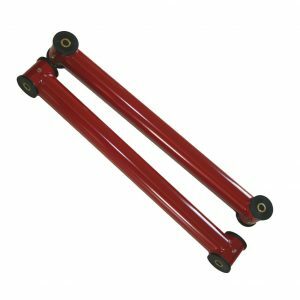 Our bolt in brackets are available in red or black powder coat for a very long lasting great looking finish. Improves launches which reduces 60 foot and 1/4 mile times. Includes all grade 10.9 plated hardware and steel sleeves (not shown). For questions on this item please email us directly at salesdept@foundersperformance.com. Great fitment and easy to install. Quality and price are outstanding!! 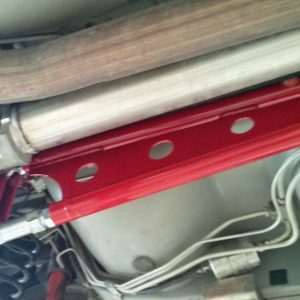 Installed these, along with thier LCA/panhard-bar set. 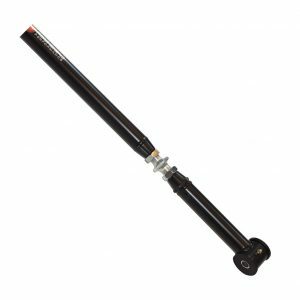 Easy to install, plus the combination tightened the rear-end up for great acceleration. 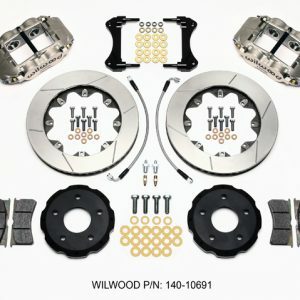 This was a great part for the price which was perfect for its application nice finish and strong and durable wish i woldve tried theyre other rear parts but wouldnt doubt build quility is any diff from the competion excellent quality and finish will buy again from you guys in the future. Great Finish,Great Price and Made in America, so you know they fit. Got them delivered to me quickly and the build quality is spot on. Very good looking welds and finish. Brackets fit on the car pretty snug, exactly what you want from this component. Cured the squatting and was able to hook with a 200 shot off the line in the top hole! Will recommend these to anyone and will buy again! Went on easily, look great and work as intended. Easy to install and went in perfect. Great product and super low price. These Lower Control Arm Relocation brackets (LCARB) are built very strong and the powder coating is great. As far as I am concerned every car that is driven aggressively needs a set of these. Founder’s has an unbeatable price. 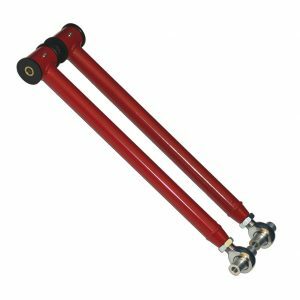 Before I put these on my car I had brand new Bilstein shocks and springs and my control arm still had an angle of + 4*; the LCA mount on the rear end was higher than the LCA mount on the body. After installing these I was able to change the angle to a -5* so the axle side of the LCA was finally lower than the body’s LCA mount. The only reason I gave these four stars instead of five is because of the fitment on the LS1 rear ends. 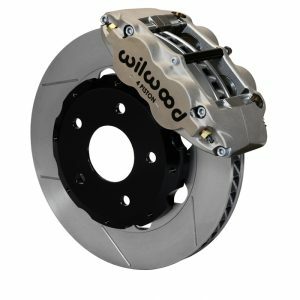 The LCARB fits around the differential’s LCA mount, exactly where the stock bracket that holds the parking brake has to go. To let the LCARB fit you must bend/reshaped or cut the stock parking brake bracket. I believe that this issue could be solved if the bracket were made to fit inside the stock LCA mount. It would have been helpful if there had been something written in the product description about this. Never the less the bracket fits very well and I am satisfied. strip before a more through review. Fit great finish looks flawless. No instructions but it’s not rocket science if you cant figure it out you might need to let somebody else put them on. I just got mt Founders Performance LCA relocation brackets. They are great… Very high quality workmanship and finish. Came with No directions, but answered questions over the phone. Took just an hour to put on. Fast shipping, and Great price. Got it out on the road and it feels like its hooking better with street tires. Using the lowest whole. Will get it to a sticky track soon. Next I’m going to get the Adj Panhard, and LCA kit. Thanks Founders. Im a fan. Inexpensive compared to others and arrived a day early. It’s installed and working. I lowered my car, and had it aligned. Shortly afterward my car started having severe tramlining issues. 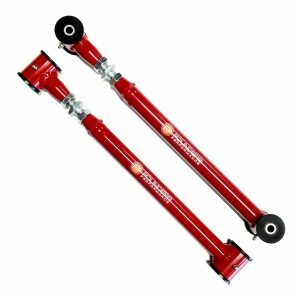 Did some research and liked the recommendations on the camaro/firebird websites for the founders performance lca relocation brackets. Ordered them, and somehow the shipping was wrong on my part, but they immediately sent out another pair. They are a work of art, beautifully designed. Installation takes 30 -45 mins. All hardware is top notch. They really transformed my car!!!! Cannot say enough good words about founders performance, their parts are world class, and their support is better than world class. I highly recommend them!!!! 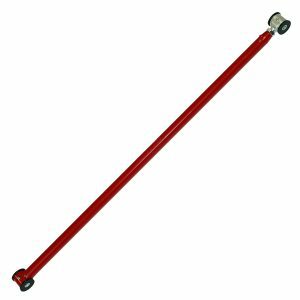 Next they need to come out with a torque arm for a 4th gen fbody. very versatle,using on a 1966 rambler conversion. 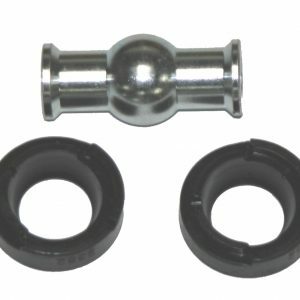 This is a quality part at a killer price. Does what it is suppose to and ita made in the good ol USA! can’t beat it! helped a lot on a lowered car with launch and acceleration. well build and sturdy. only issue was on my car a ’98 camaro there were some brake line brackets that got in the way small modification no big deal. Just FYI. These work! On my lowered 1995 Z28 M6 I was having traction issues bad. I installed these and my traction has improved. Definitely recommended! No wheel hop for me! Yes, the price point lower but there is no sacrifice of quality. I ordered the PHB relocation as well. If I had known then what I know now, I would have saved over $400. These are quality parts and I would put them up agents any other vendor. They are great all the way around! Outstanding price! Highly recommend. 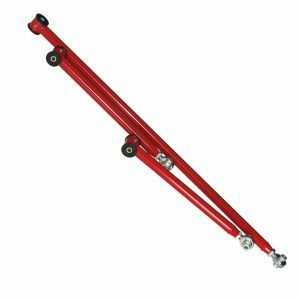 Purchased these for my 83 Camaro since I lowered the rear end about 2′ give or take, that put the control arms out of wack. These were very easy to install and I loved how it came with all the hardware needed and like it says, its 100% bolt on. Works perfect. Quality superb. I have been a long time FP customer and always been happy. Going to order a PHB in a few weeks. Easy to install with all the supplied hardware. Looks like a sturdy product. Great product and recommend it for the price. Shipping was cost effective to Canada. Yet another great product from founders. I added these along with tubular lca and no more wheel hop. they fit my car perfect with no modifications. Quality product all arround. Dont waste your money on the big name brands. 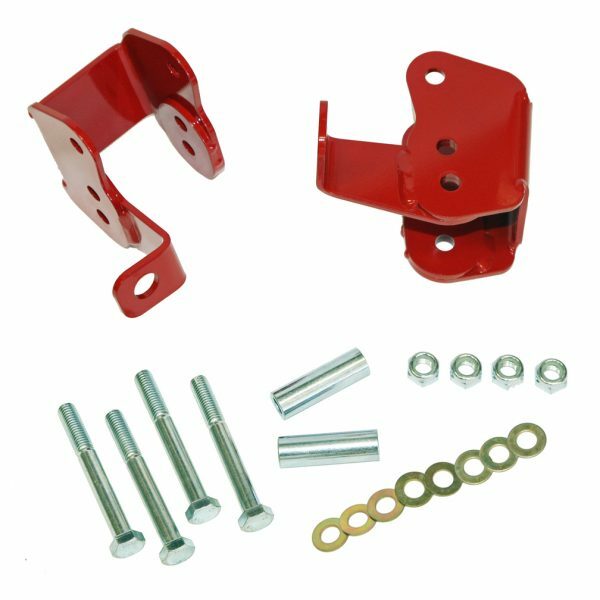 Lower control arm brackets are of great quality and low price. Shipped quickly too. Will order other Founder’s products in the future. Purchased the bolt ins along with Founders on car adjustable pan hard and LCA’s for my 1995 T/A. Everything shipped quick, great quality workmanship in these pieces. Everything fit perfectly without any modifications at a terrific price over the competition! A+ product here. All the holes lined up perfect, no missing hardware, I cant think of a better way to make this part. I was a little concerned that it wouldn’t include the sleeves (doesn’t show sleeves in picture) but it does. Would buy again. Excellent produxt at a great value. Quality of welds and powder coating look very good. Wow. My h/c/i car had the worst wheel hop I ha ever seen. I put these brackets on my car, and even with all stock 130,000 mile suspension it nearly eliminated wheel hop all together. I can’t wait for the lca’s and panhard coming today! Exactly as described. Very stout (1 piece makes it that much stronger) very nice looking powder coating. Wish it would have came with instructions but a quick google search and I found how to install. I’m lowered on Eibach pro kit springs and this fixed the geometry of the LCA (Fixed Founders). I had installed a similar set on my car from a different company about 8 years ago. After a rear end swap I needed to purchase new ones. I was suprised to see how much the other companies prices had gone up, but Founders still offered them at a great price. I was also happy to see them offering the parts in bare metal, as I prefer to weld them to my housing, and coat the housing at after. The items appear top quality showing great craftmanship. Of course if you are reading this you already know the benifits of the brackets so I won’t go into that. When I received these I was really impressed with the quality, great looking piece and I looked forward to using them on the race car!! I have not had the time to install the control arm relocation brackets on my car as of yet. I did test fit them on a spare rear housing and the brackets lined up and fit great. These brackets are good looking and looks to fit great. Haven’t installed them yet but did a test fit. very happy with this part. fit perfectly. I normally do not spend my time writing to a company regarding the products they produce. But I am going to take some time out of my day to go ahead and send this review. 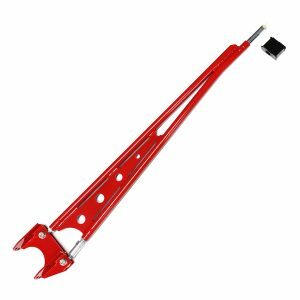 I ordered your LCA relocation brackets for a 98-02 F-Body. I noticed due to inclement weather they took awhile to arrive here on FT.BRAGG. This was of course out of your control. Now onto the product review. After opening the package I inspected the relocation brackets and let me tell you I am very much impressed. I have owned many other F-Body’s 3rd and 4th gens. I previously almost exclusively used UMI suspension products. And they do produce a great product. However, after much reading of reviews on LS1TECH.COM about your products I pulled the trigger and decided to give you guys a try. And I will say I do not regret it. Your prices are outstanding! 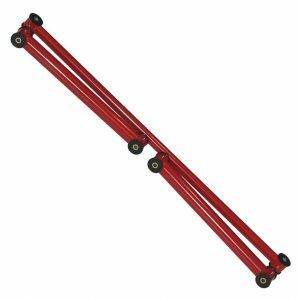 And the quality I have seen in these brackets are on par with the BIG NAME companies such as UMI, BMR etc.”YOU GET WHAT YOU PAY FOR” does not apply here. On that note I want to thank you for providing a great product at a reasonable price. I will spread the word about your company on the forums as well as the local community. I also am wondering if you provide a military discount? Not that is matters with the great prices you offer. I look forward to doing business with you guys in the very near future. 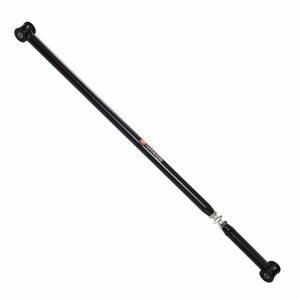 I will be ordering a adjustable Panhardbar & Poly/Rod adjustable LCA’s shortly. Thank you once again for a great quality product at a great price! The relocation brackets are very well made and fit perfect. Easy install on my 02 Trans Am, only have to cut the e-brake bracket and all else bolts on. Worked great at the drag strip. No wheel hop. As good a product as I have seen. 100% best value with no compromise in quality!